Check out the Nest Alexander Hybrid instead!! The Alexander Hybrid Luxury Contour is the newest release from Nest Bedding. This hybrid mattress has an interesting design, and I’m excited to get a first look at how it feels and performs. Interested in learning more about the Hybrid Contour? Read on for my full review! Short on time? Click here to jump to the review summary. Due to their belief that no single mattress could be the perfect fit for everyone, Nest bedding carries a line of mattresses that vary in design and feel to help find the perfect fit for you. All of their mattresses are made in the United States and can be shipped directly to your door or purchased in one of their stores across the country. Today I’ll be reviewing the Alexander Hybrid Luxury Contour, a new model from Nest Bedding, which uses a combination of coil and foam layers. 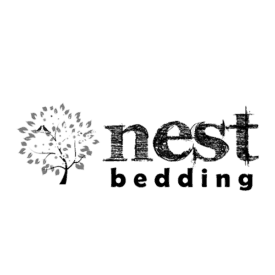 The Nest Bedding line does contain two other hybrid mattresses, however neither of these offer a soft option, and the Contour only comes in a soft firmness level. One of the things that stands out when looking at the construction of the Hybrid Contour is the use of materials that will help cool the mattress so the sleeper doesn’t overheat. I would also like to note the use of a pocketed coil layer, which should lend support to a mattress that is designed for an overall softer feel. Cover – The cover of the Alexander Hybrid Luxury Contour is made of polyester, which is blended with a phase change material. Phase change material is known for its ability to help regulate temperature, and the cover of this mattress is actually cool to the touch. The cover is pretty stretchy, snapping back into place quickly when I grab and tug at it, so it won’t bunch up when you move around on the mattress. Also of note, there are 1.5 inches of copper infused gel memory foam, with a density of 2.5 lbs, quilted into the cover. This is a soft layer and will provide some initial pressure relief when lying on the mattress as well as a little bit of contour. Some types of memory foam have a reputation for trapping body heat, but the copper infused gel foam should draw heat away from your body to help sleep cooler. Comfort Layer – Immediately below the cover is a comfort layer consisting of 2 inches of Energex foam (3 lb density). This layer is pretty soft to allow further pressure relief, but it has a quick response to pressure so you won’t feel stuck in the mattress. This layer will provide much of the feel to the mattress, and while it is pretty soft to allow you to sink in to relieve pressure, the material gives the hybrid contour some bounce. Memory Foam – Below the comfort layer is a 1 inch layer of memory foam, which has a 4 lb density. This layer will provide further pressure relief and contour to sleepers that push further into the mattress. I suspect memory foam this far down in the mattress construction will be a big plus for side sleepers. Support Layer – Below the memory foam is a 3 inch tall pocketed coil support system. This layer will support both the foam layers above, as well as the sleeper on top of the mattress. ocketed coils will add some springiness to the mattress and are great for temperature regulation, as they create space for air to flow through freely. Base – The base of the Hybrid Contour is made of 4 inches of high density poly foam. This layer is very firm and provides foundational support for the structure as a whole. It also gives the mattress its shape and adds some durability. Like that hybrid feel? Check out my best hybrid mattress picks. The initial feel when I press into the Hybrid Contour is the soft quilted layer in the cover. Even though the soft quilted cover gives way quickly, there is a quick response overall due to the Energex foam beneath it. The cover is pretty thin, so when I push with both hands I can feel some air flow through the Hybrid Contour, showing that the mattress is pretty breathable. Due to different sizes and weight distributions, everyone will feel firmness a bit differently. Rather than just giving my opinion on the overall firmness level, I brought in three other people to give their opinion as well. This should give a better sense of the firmness range you can expect from the Hybrid Contour. 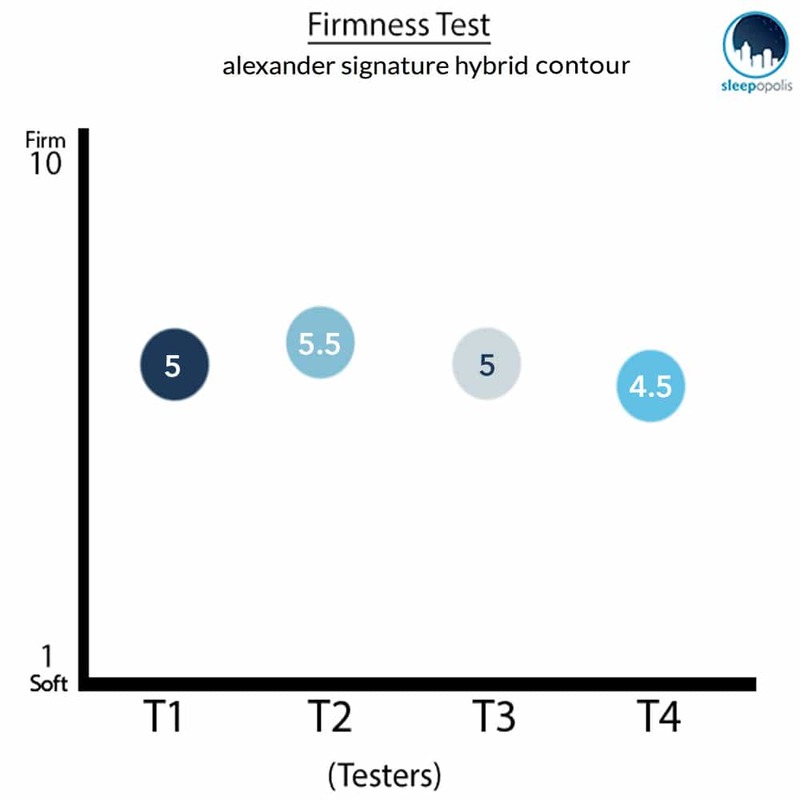 With an average rating of 5/10 on the firmness scale, the testers found the Hybrid Contour to be a soft mattress. A 6.5/10 rating is thought of as a medium firmness, and the rating given by the testers during this portion of the review shows that most will find this mattress to be on the softer side. Love the plush feel? See my best soft mattress picks. I found that the combination of the quilted cover and foam top layers created a soft feeling overall. 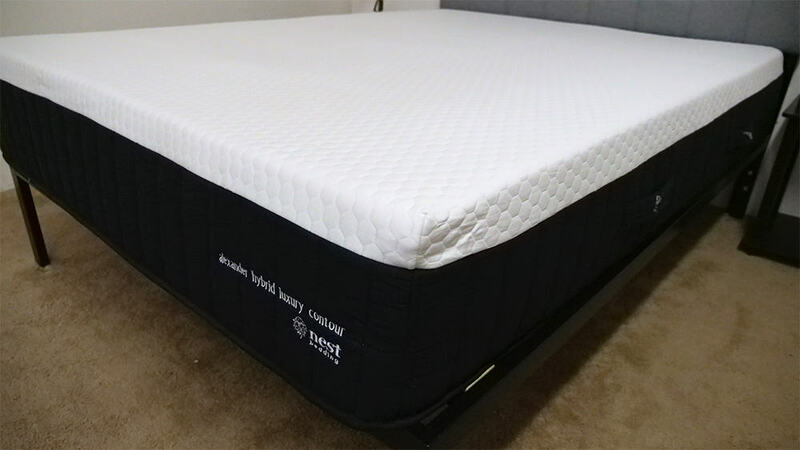 I was able to sink into the mattress a bit, but the Energex foam and coils combine to give the Hybrid Contour some good bounce, meaning I didn’t have the stuck feeling often associated with sinking into memory foam. Instead of just describing the feel of the Hybrid Contour I wanted to give a visual representation of where someone may feel pressure points for while lying on the mattress. To do this, I placed a pressure map on top of and lied on my back, side, and stomach. On the image below you will see pressure represented from blue (low pressure) to red (high pressure). The first thing I feel when lying on my back is the soft quilted layer letting me sink into the mattress a bit to relieve pressure. This also allows the foam layers of the mattress to fill in the space beneath my lower back, which is good for back sleepers. You can see on the graphic above that my weight is pretty evenly distributed in this position, creating low pressure across my entire back. I should also note that I was able to change positions on the Hybrid Contour without too much added effort. Once I rolled onto my side I was very impressed with the level of pressure relief provided by the Hybrid Contour. Side sleepers often have issues with pressure points forming at the hips and shoulders, due to increased weight concentration, that can cause aches and pains. The results above show a very low rise in pressure at the hips, but overall this is a very impressive pressure map result. This goes along with what I felt while lying on the Hybrid Contour, as the mattress allowed me to sink in a bit so I didn’t feel pressure points form in this position. When lying on my stomach, my weight is again evenly distributed, causing low pressure across the entire surface of my body. This low pressure helps as stomach sleepers can experience trouble breathing if there is too much pressure on the chest. Their also is low pressure seen at the hips, and I felt the coils did a good job of keeping them from sinking into the mattress. This is important for stomach sleepers because if the hips sink too far into the mattress it will put their back in a bad position. 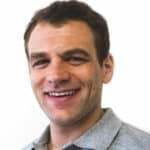 If you plan on sharing your bed with a partner, you will want to know what it will feel like when someone gets into and out of bed or tosses and turns during the night. This next test is helpful in showing the intensity of motion that is detectable from one side of the mattress to the other. The Hybrid Contour had one of the best motion transfer performances of any mattress I have tested. 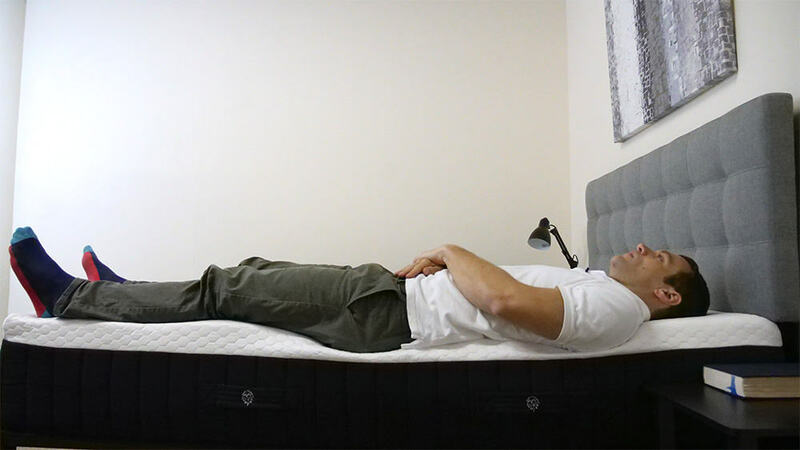 The 4 inch drop, which simulates someone tossing and turning on the other side of the bed, shows almost no disturbance to the other side of the mattress. 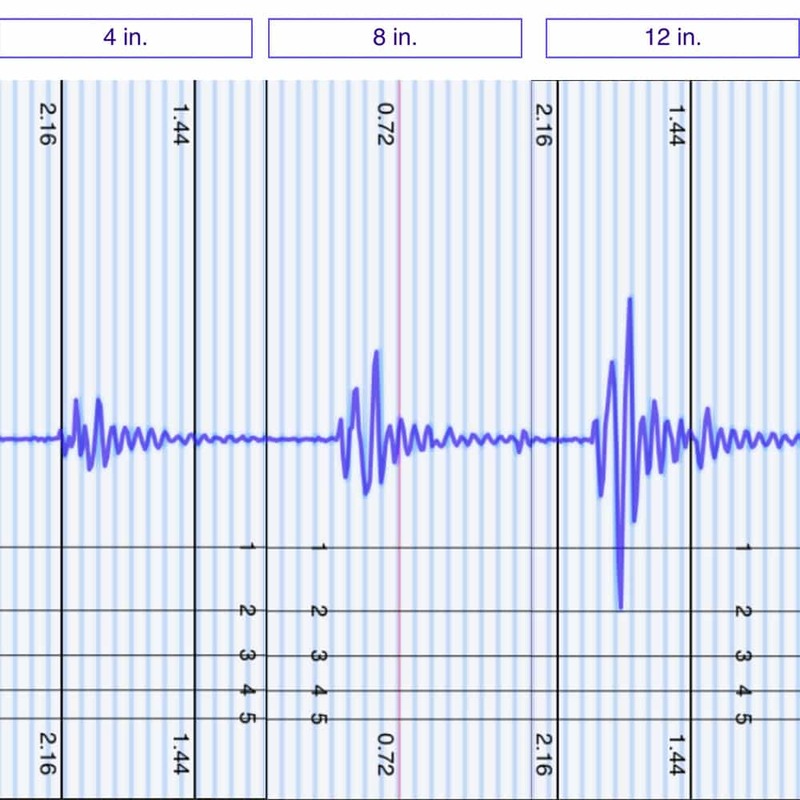 The 8 inch drop which simulates someone getting into or out of bed, shows a slightly larger disturbance, but still a very low level of transfer. Finally, while the 12 inch drop shows a bigger spike, it is relatively low when compared to other hybrid mattresses and the disturbance quickly dissipates. Many people buying a mattress will want to know if they will feel more on top of the mattress or get a sense of sinking into it. 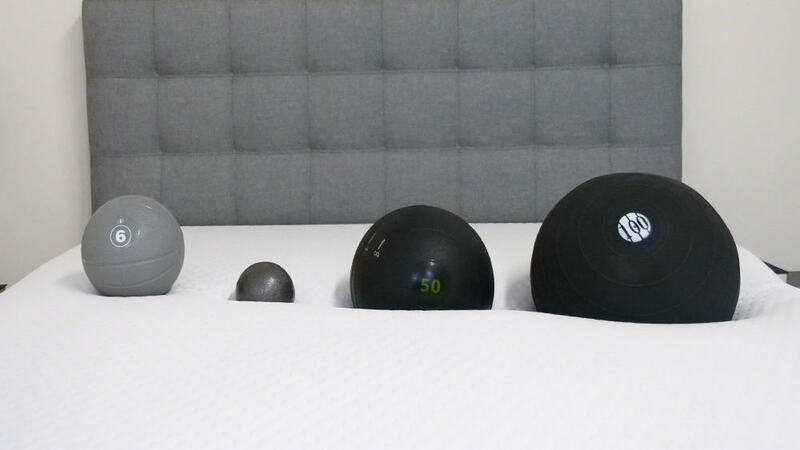 In order to get a good idea of how someone might sink into the Hybrid Contour, I used four balls of varying sizes and densities (a 6 lb medicine ball, a 10 lb steel ball, a 50 lb medicine ball, and a 100 lb medicine ball) and place them on the mattress to measure how much they compress the surface. If you’re going to share your bed with a partner, and need to use the entire surface, then edge support is something you are going to want to take a look at. Bed in a box mattresses can sometimes struggle in this area, when compared to traditional innerspring mattresses, so I was interested to see how the hybrid construction performed. When lying near the side of the Hybrid Contour, I felt even support from the center of the mattress to the edge. As you can see from the image above there is some compression through the quilted cover and top layer of foam, but that is to be expected with soft layers. In the image above you can see that, when on my side near the edge of the mattress, the hybrid contour does a good job of supporting my weight. The mattress did a good job of allowing my shoulders and hips to sink in for pressure relief, while supporting my body as a whole to keep my back in a good position. By sitting on the edge of the mattress I concentrate all of my weight over a single location. This causes the top foam layers to compress, which is to be expected in this position. Something to take note of is the fact that the high density base foam and coil layer continued to support me in this position, even with the higher weight concentration. Sleep Trial: There is a 100 night trial for the Hybrid Contour. Warranty: Nest Bedding offers a lifetime warranty. Shipping: This mattress ships free to the continental United States, and will arrive compressed in a box. On the heavy side? See my best mattress choices for heavy sleepers. Convinced the Hybrid Contour is for you? Use the code SLEEPOP150 to save $150! Is the Alexander Hybrid Signature Contour right for you? Now that we’ve taken a deep dive into the Hybrid Contour, it’s time discuss who I think would fit well with this mattress. Sleep on your side – The Hybrid Contour is a soft mattress that allows for a bit of sinkage into the mattress, which is great for pressure relief. 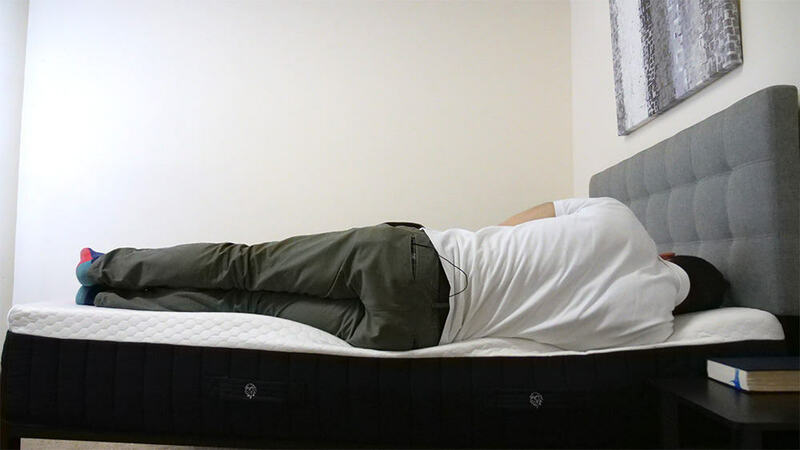 Side sleepers need to be careful of increased pressure at the hips and shoulders and, as the pressure map shows, this mattress does a good job of distributing weight to avoid the formation of pressure points. Worried about sleeping hot – As I mentioned during the construction portion of the review, Nest used materials, such as the phase change material in the cover and the copper infused gel foam in the quilting layer, that are designed to help regulate temperature. Also, the pocketed coil layer will allow for greater airflow, helping to cool the mattress. Share the bed – Given the good performance by the Hybrid Contour on both the Motion Transfer and Edge Support tests, I would recommend this mattress if you sleep with a partner. Luxury Feel – As the name states, this mattress has a luxurious feel to it. 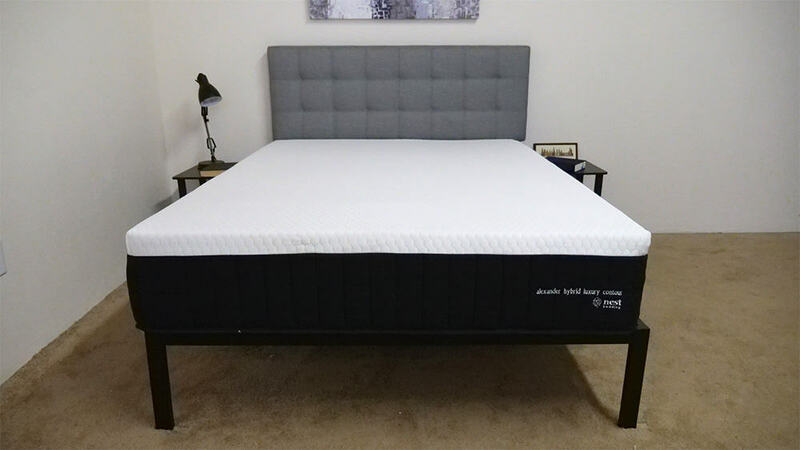 The Alexander Hybrid Luxury Contour is comparable to a bed you would find in a high end hotel and is priced toward the higher end of the Nest line. 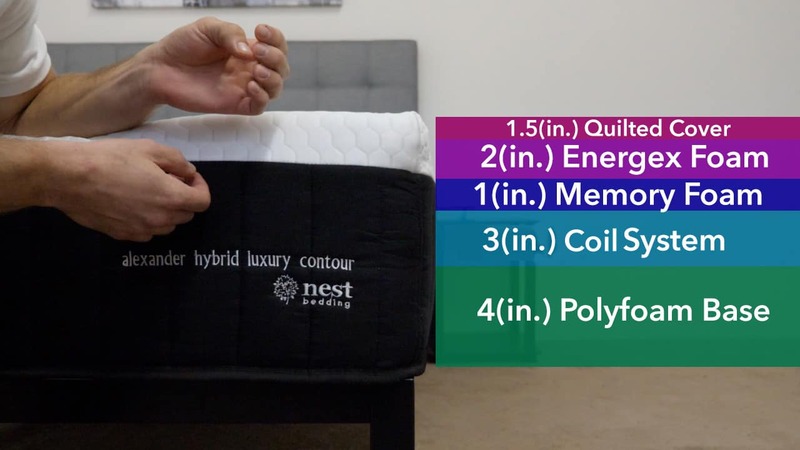 Check out Nest Bedding to learn more about the Alexander Hybrid Luxury Contour. The Nest Hybrid Contour uses a mixture of foam and coil layers to provide a luxury feel that I think is great for side sleepers. 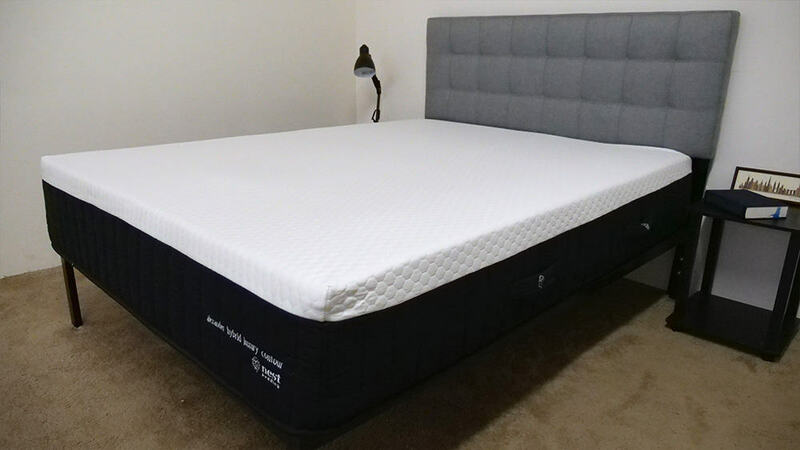 This mattress has a focus on sleeping cool, using materials such as copper infused gel memory foam and phase change material to draw heat away from the sleeper. This could be a good option for side sleepers who want some foam contouring but want to avoid having too much heat trapped close to the bed’s surface.